When President Michel Martelly was elected in April of 2011 he made a promise to create space for all Haitian children at school. Soon after, he announced his intention to tax all international phone calls as well as money transfers in and out of Haiti in order to fund the policy. Although the Haitian constitution does not give the president the power to levy taxes, Martelly launched a ‘National Fund for Education’ in May 2011 with the goal of collecting $8.5 million per month by taxing all international phone calls in and out of Haiti at 5 cents per minute and all international money transfers at $1.50 per transfer. Haiti’s largest source of foreign revenue is the money transfers that its Diaspora sends back to family members. For most Haitians, education is an unattainable goal. According to the UN, the cost of an elementary school education can be prohibitive–40 per cent of family income to the average Haitian family. Only about two-thirds of Haitian children were enrolled in primary school before the earthquake; less than one third of those reach sixth grade. Haiti’s illiteracy rate is an astonishing 57.24 percent, the highest in the western hemisphere. Martelly’s ambitious promise was to subsidize school fees through a scholarship program that would provide an education to every primary school aged child (ages 6 to12). He then waived all the registration fees for Haiti’s primary schools. Universal education is a laudable goal, but can Martelly’s government pay for it and will he carry out the required collaboration with Haiti’s teachers and other educators? The National Education Fund (FNE) is administered by Foreign Minister Laurent Lamothe and is without parliamentary supervision. According to Haitian government estimates, the Fund ought to have approximately 60 million dollars in its account. In September, Martelly’s former education advisor, Gaston George Merisier, claimed that the FNE contained 28 million dollars. Merisier’s figure was contradicted, however, by the Governor of the Bank of the Republic of Haiti, who said the account only held 4.8 million dollars. Other reports say that the account holds as little as 2 million dollars. Martelly’s education advisor Dimitri Nau has acknowledged that “none of the money collected through a tax on international calls and money transfers is being used towards education in Haiti.” This persuaded Digicel CEO, Denis O’Brien to demand an audit of the FNE (Digicel is one of the two, large telecommunications companies that collected the taxes for the FNE). Nau also acknowledged that more than half the 903,000 students for whom the government claims it has covered fees were already attending Haiti’s free national school system. Their $2.50 to $5 annual registration fee was paid for by the Clinton Foundation, not the FNE. The other 400,000 students are benefitting from an ‘Education for All’ program launched by the World Bank and other international banks. Martelly has taken full credit for claimed successes of the program. His international supporters repeat the claims. 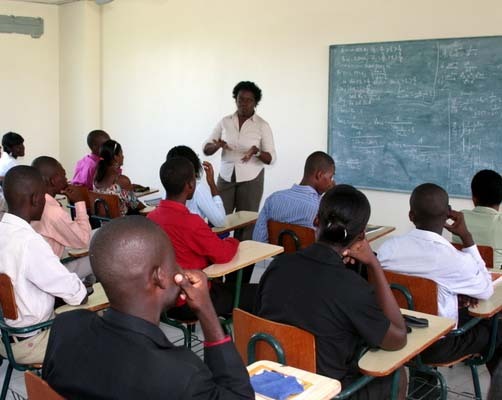 Accusations of government incompetence can also be heard among staff and students at the State University of Haiti (UEH). Students have protested several times against Martelly’s closure of the Department of Ethnology and lack of funding. Professors have joined protests, claiming the Martelly administration is deliberately underfunding the university because of the democratic nature of the institution. The UEH suffered huge losses after the earthquake. A study by the Inter-University Institute for Research and Development in March, 2010 found that the earthquake destroyed nine of the 11 UEH faculties in the capital. Three hundred and eighty students and more than 50 professors and administrative staff disappeared. Two thousand students and 130 professors in all of the institutions of higher learning in Haiti died in the catastrophe. Currently, the majority of the 13,000 students at the UEH’s faculties in the capital are squeezed into cramped sheds, struggling to learn under the intense heat. A new report by Haiti Grassroots Watch (HGW) notes that the chronic underfunding and lack of facilities was foreseen by university administrators over a year ago. The report explains that the Rectorate of the UEH submitted a proposal to the Interim Haiti Recovery Commission (IHRC), the institution previously charged with approving and coordinating most reconstruction projects. Delay after delay meant that the proposal was never reviewed before the Commission’s mandate expired in October 2011. UEH administrators argue that their proposal was ignored in order to prevent the consolidation of the university’s 11 departments into one location, a key demand in the proposal. The departments are spread throughout Port au Prince, making communication and collaborative work extremely difficult. Why would Martelly’s administration and the IHRC withhold funding for the UEH while quickly approving funding for private universities? Evidently, a pro-private enterprise model is guiding the restructuration of Haitian education at all levels. According to a report on Alterpresse, the 2011-12 national budget dedicates only .55 percent to the UEH, down from one percent in 2006. Despite the poor funding of Haiti’s school system, some remarkable individuals and institutions have managed to create successful learning environments. SOPUDEP is a school that provides free accessible education to adults and children and supports women’s rights and economic empowerment for the poor. Director Rea Dol is a community organizer. She directs adult literacy programs, a micro-credit program designed to increase the autonomy of women and an HIV-AIDS prevention and treatment program. SOPUDEP does not receive government funds; it is dependent on financial support from international supporters, including the Sawatzky Family Foundation in Ontario. The Boston-based global health agency Partners In Health is completing construction of a world-class teaching hospital in Mirebalais, Haiti. The 320-bed hospital will offer a level of care never before available at a public facility in Haiti. UNIFA, SOPUDEP and other education achievements are results of former president Jean-Bertrand Aristide’s dedication to education. He was ousted in a paramilitary coup in 2004 with key backing from Haiti’s elite and the governments of France, the United-States, and Canada. During Aristide’s two terms, from 1994 to 2004, the Haitian government built or refurbished one hundred and ninety-five primary schools and 104 high schools. In a recent interview, Aristide explained, “Learning is strengthened and solidified when it occurs in a safe, secure and normal environment. Hence our responsibility to promote social cohesion, democratic growth, sustainable development, self-determination; in short, the goals set forth for this new millennium.” Aristide’s views concur with those of leading educators on how to maximize learning in the classroom. By all evidence, Michel Martelly’s education policies are hindering, not helping, educators in Haiti. His apparent dedication to failed neoliberal policies stands in contrast to the successful education models already existing and upon whose success so much more can be built. 1. Haiti’s Le Nouvelliste daily recently reported that the FNE paid teacher salaries for the first three months of the school year, October to December, in three of Haiti’s ten departments. … Let me explain this free education program enacted by President Martelly. The capital raised was supposed to send 903,000 new students to school and build 22,575 new classrooms. They have yet to make a single classroom. It is all a lie. The program is to support 45 students in grades 4 and 5per school. Each of these students would receive $90 in compensation, which equals $4050per school. The officials visited our school and I filled out the forms. But neither our school nor any other that I know of have received any money from the government. If Martelly wants to do something good for education in Haiti, he needs to pay the public school teachers, who have not received a pay cheque for the past 12 to 20 months. He also needs to make good on his promise to build all those new classrooms. I heard a person call Martelly a mobster today on the radio. The President is a liar. It is now March and I am not sure if any schools have received this compensation money. If, like many other schools in Haiti, I didn’t have international support, I would have to rely on this money to pay my staff. However, if I received the $4050 for those 45 students, how could I pay the staff? How could I take $405 a month and split that among my teachers? We would not survive on this plan, but because of international support we will.